MOORESVILLE, N.C. — Are you following Charlie and Maverick on Instagram? Their owners, Chelsea and Adam Stipe of Mooresville, just started their account three days ago, and, with just seven posts, the pair already has 37,000 followers and counting. So what's the adorable duo's social media secret? 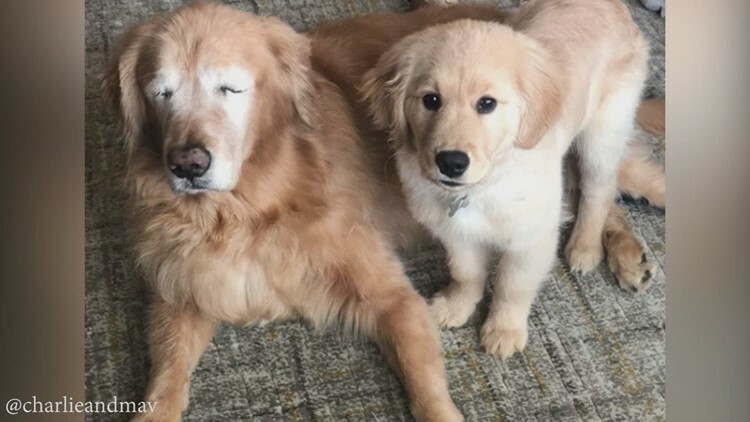 Charlie is an 11-year-old golden retriever who is blind. His eyes were removed in 2016 and 2017 because of glaucoma. "It definitely slowed him down but didn't stop him," Chelsea Stipe told NBC Charlotte. Maverick, a 4-month-old puppy joined the family a few months ago. Stipe said he keeps Charlie young. However, they didn't get along at first. "Charlie was not loving the puppy love initially, but Maverick grew on him," Stipe said. The pictures and video on Instagram prove that. You can see the pair snuggling, playing, and snacking together. The Stipes moved to North Carolina from Pennsylvania in 2016. Back then, it was just three of them. Now they're a family of five with Charlie, Maverick, and the recent arrival of baby Asher. With an elderly dog, a young pup, and a newborn in the house, the Stipes stay busy. But they're enjoying the internet's response to Charlie and Maverick, even if it's all a bit overwhelming. "Yes, but it's all been so positive! We love the community that surrounds the account," said Stipe.